A diving flashlight is an essential tool for enhancing your underwater experience. While life underwater is incredibly colorful and beautiful to see, the deeper you go, the less light is allowed in and the colors will become grayer and more difficult to pinpoint. A good diving flashlight will not only enhance your overall experience, but it is also an important safety tool to consider, especially when scuba diving at nighttime or within caves or wreckages. When shopping for the right diving flashlight, it is important to take into consideration your intentions, the environment, and your skill level. Recreational divers, for example, typically only require a light that is suited for a standard depth rate of 100 feet or less. The more experienced diver, on the hand, may require a more rugged and waterproof light that is capable of reaching deeper depths. Other factors to consider are battery runtimes and beam throws, both of which we've reviewed below in our extended buyers' guide to help you find the right diving flashlight for your individual needs. After a thorough review, we've selected the SL4 eLED L1, from Underwater Kinetics, as our number one diving flashlight that is available from our catalog. This handheld light is ideally meant for use as a secondary dive light as it offers a narrow, penetrating beam that is perfect for illuminating crevices and finding hidden creatures in the cracks. The 400-lumen diving flashlight is incredibly durable and can withstand the abuse it is bound to endure. 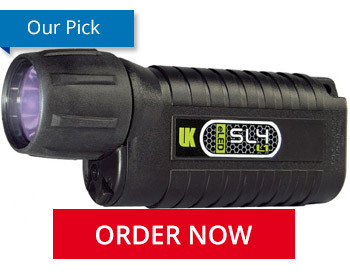 The UK SL4 eLED L1 dive light is capable of reaching a 500-foot depth and offers an extended 10-hour runtime while using standard non-rechargeable C batteries. For the experienced deep diver, this diving flashlight is the perfect choice as a secondary dive light. Are you looking for the best primary dive light? If so, look no further than the Princton Tec Sector 5 pistol grip flashlight. This handheld light features an easy-to-use trigger switch that works even while wearing gloves. The 550-lumen flashlight also runs of non-rechargeable C batteries and offers an impressive 24-hour runtime. In addition to these highlighted products, we also put together a list of some of our other favorite diving flashlight below. Please feel free to browse through the entire selection to find the right light for your needs. A scuba diving flashlight can be separated into a two different types: primary and secondary dive lights. A primary dive light exactly what it sounds like - your main source of illumination. This type of diving flashlight is typically larger, brighter, and longer lasting. The design of a primary dive light is also built for comfort as you will be holding it for long periods of time. For this reason, we recommend using a scuba diving flashlight with either a pistol grip or lantern grip. These types of grips are typically smaller than the body of standard handheld flashlights and are therefore more ergonomically correct for holding throughout a long dive. The pistol and lantern grip dive lights are specifically designed for effortless operation, even while wearing gloves. Secondary dive lights, on the other hand, are often used as an emergency back-up for when the primary dive light fails. This type of diving flashlight is therefore typically more compact, lightweight, and less powerful. In terms of size, we suggest choosing a light that is small enough to fit in a BCD pocket. It is also important to consider your light's battery runtime, when selecting a secondary dive light. As you know, batteries naturally discharge over time, regardless of whether they are in use or not. Non-rechargeable, lithium batteries are therefore your best choice for powering dive lights. You may also want to consider a secondary dive light that is equipped with an SOS output option, which can then be used, if necessary, to notify your dive buddy of an emergency. Daytime dives, for example, may only require the use of a secondary dive light. You may even ask, "but it's daytime, why do I need a light at all?" While diving during the daytime, you may assume you would be able to see more colors; however, it is important to remember that the deeper you dive, the less water is allowed in. In fact, after 30 feet deep underwater, colorful coral and creatures will begin to look gray and blend in with their surroundings. A diving flashlight that offers a narrow beam gives daytime divers the ability to illuminate hidden cracks and areas to find those creatures in all of their beauty. Night diving, on the other hand, relies heavily on a light's runtime. As mentioned above, we recommend utilizing a flashlight that runs on Lithium primary batteries. Night divers must also consider beam throw. A broader beam is best for illuminating a larger area, thus making your adventure easier and safer. We suggest using a broad beam diving flashlight as your primary source of illumination, and carrying a secondary dive light with a narrow beam for illuminating dark corners or crevices. When it comes to night diving, the brighter the better. Cave diving and other low visibility areas requires the use of a tight, bright beam so as to illuminate dark corners and under ledges. When diving in murky water, a wide-beamed light with a broad spill may reflect off of the particles in the water and therefore make it more difficult for you to see, which is the opposite of what a diving flashlight is designed to do. For this reason, we recommend using a dive light that offers a bright spot with a minor or moderate spill out, such as with the UK C8 eLED pistol grip light. While LED dive lights are becoming the standard, it is important to explain the differences between those and HID and Xenon bulbs, as their individual features may match better with your intended use. HID bulbs, better known as high intensity discharge lamps, are efficient and create a beam of light that travels far in water. To break it down further, it is important to understand that water is more dense than air and it therefore absorbs and refracts more light, and certain colors disappear quicker. Red, for example, is the first color to be absorb by water's "filter&quit;, with orange and yellow the next two in line. HID dive lights, were designed to offer a blue-violet 6000° color temperature, which allows light to travel farther underwater and therefore illuminate the beautiful colors. LED diving flashlights are more efficient, stronger, and lasts longer. Like HID, LED bulbs offer a whiter color temperature that can travel farther underwater. The most important feature of LED dive lights is their ability to produce constant, ongoing illumination, even when batteries are running low. This is especially important when safety is considered. Finally, Xenon lights are more budget-friendly; however, they are not as bright and offer a warmer color that does not travel as far through water. If budget is a determining factor, Xenon dive lights are a satisfactory choice for recreational diving. In addition to selecting a reliable diving flashlight before your next adventure, we recommend considering the addition of a marker light to your equipment bag. Marker lights are typically worn on a diver's tank in order to remain visible to fellow divers and buddies during a nighttime dive. These beacons should produce a minimal lumen output, such as with the Glo Toob AAA, which is available in a variety of color outputs. Please remember to review water resistance rating, prior to making your purchase. The Glo Toob AAA marker light is designed for depths up to 200 feet. Before embarking on every dive, please remember to check your diving flashlight's O-rings and batteries. Are they fresh batteries? Are there any cracks or dents in your light? While scuba diving is a fun and exciting activity, it is also extremely dangerous. After each trip, make sure to rinse your equipment clean from the salt water and to remove the batteries to prevent further drain. Whether you are an experienced professional looking to replace an existing light, or a novice diver looking to enhance your adventure, finding the right diving flashlight is an important task that should be taken lightly. To recap, when choosing a primary dive light, it is important to choose a torch that offers a tight, bright beam that a long run time. It should also be rated properly to coincide with with depth at which you will be diving. Please feel free to browse our entire selection to find the right light for your individual needs.